View: Which folders or sub-folders can this user see? Download: Which folders can this user download assets from? Do they require approval prior to download on any of these? Upload: Which folders can this user upload assets into? Do these asset require approval prior to appearing live in the site? Edit: Which folders of assets does this user have permission to edit? Do these changes need to be approved prior to going live? You can also decide which attributes members of a group can see, what download options are available and whether or not the users have access to Advanced Download. Read more about Folders. You can choose to set up permissions in Asset Bank so that some users need to gain approval for either uploads, edits or downloads. 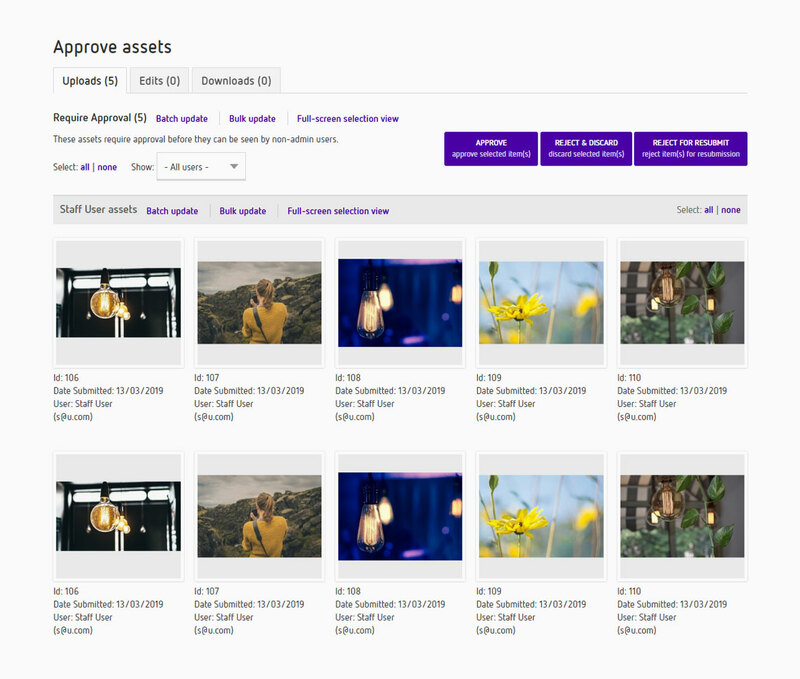 Uploading: Users will upload as normal, but their assets will go into a holding area. Approvers will then be notified by email that an upload requires approval. They will then proceed to the approval area where they can individually or bulk approve, reject or reject for re-submission. Only after the assets have been approved will they be visible to other users. Editing: If a user has edit with approval permission, then after they edit an asset a notification will be sent to the approvers. Meanwhile the original asset in its original form will still be visible to other users. Only after the edit has been approved will it take the place of the existing asset. Downloading: Users without direct download permission (i.e. who have downloaded after approval), first add the assets they require to their light box. From here they request approval, and after this has been granted, will be able to download the assets from the light box area. Asset Bank offers comprehensive user management with the following key features. User Import: Giving you the ability to quickly set up many user accounts. Registration: When approving registrations you can optionally set an expiry date for a user account. User Fields: Dictate which fields appear on the registration page to ensure you capture the information you need. Automatic user approval: Optional automatic approval of registrations for given email domains (e.g. for users with email addresses that match '...@yourCompany.com'). User Expiry:Allowing you to set an expiry date for users at approval stage. Messaging: You can choose to contact individuals, members of a group or all users of your Asset Bank. Login as this user: Allowing admins to quickly see what a particular user is seeing. Extensive reporting options allow you to keep track of how your Asset Bank is being used. User Reports: Set a date range and choose one of the 16 reports including 'Number of downloads per user' and 'Number of views per item'. Scheduling Reports: Decide which of these reports you would like automatically generated and emailed to you (or a group of users) on a regular basis. Search Reports: Find out what search terms people are using to find assets, learn from these and ensure common searches generate the results you want. Asset Reports: Including most popular items by view or download and total number of assets in your Asset Bank. Duplicates: Allowing you to view potential duplicate assets side by side, and remove those that are, keeping you Asset Bank in order. 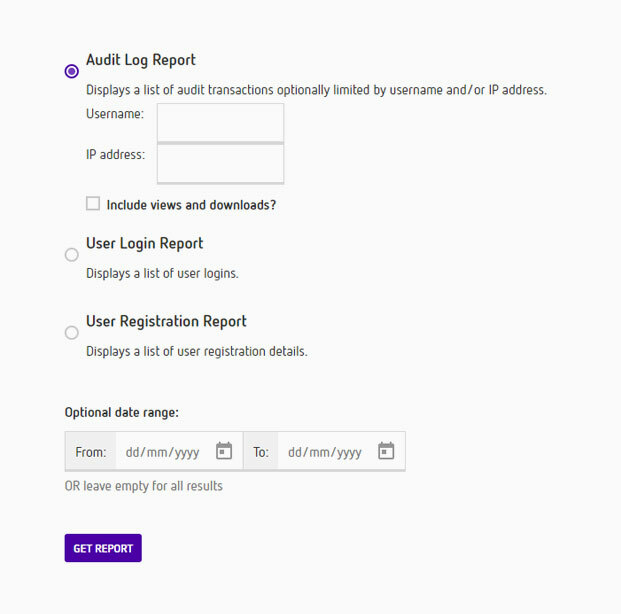 Audit logging: Full audit logging and audit reports, so you can track what your users are doing within Asset Bank: uploads, edits, deletions, views, downloads and searches. System Reports: See the history of emails generated by the system and find out how many user sessions are currently active.